What Is the Cleansing Action of Detergent & Soap? 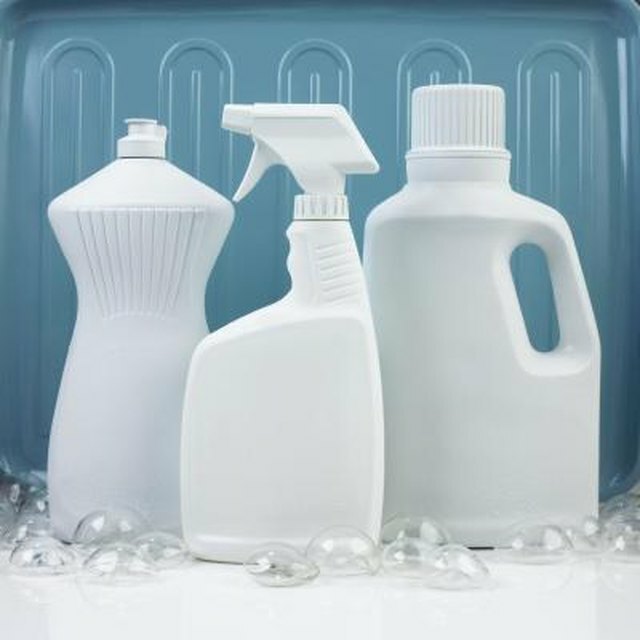 We all know that detergents and soaps are used to clean items by removing bacteria and dirt. However, not many people understand how exactly these cleaners work. In fact, most people have probably never wondered how the chemical reactions in soap and water combine to remove dirt and stains. The exact chemistry behind the science of cleaning dirty items is surprisingly complex and yet is fairly easy to comprehend. Soaps and detergents have been around for thousands of years. The earliest soaps were created in the Ancient Near East. Early soaps were made from water, alkali salts, animal fat, vegetable oils, ashes or lye. Industrially made modern soaps first appeared at the end of the eighteenth century. Detergents for cleaning clothes and dishes are synthetic and often oil-based. These first became common in the 1930s. Active cleaning ingredients in soap include polyethylene glycols, which act as surfactants. Glycerine is a common emollient found in soap, and many soaps also contain compounds that can soften the water. In addition, triclosan or another similar chemical is used as an anti-bacterial agent. Detergents often contain similar active ingredients. Soaps and detergents work because they contain surfactants. A surfactant is any molecule that reduces water tension and bonds to dirt. Once the dirt and surfactants are bonded, the rinse water washes the surfactants away, taking dirt and grime with it. Synthetic surfactants bond to particles because they hold a charge. Depending on the surfactant used, when mixed with water it can take on a positive or negative charge. Most surfactants used in detergents and soaps become positively charged when mixed with water. Basically, a soap is a cleaner that contains animal fats or vegetable oils and is usually bonded with lye. Detergents are more complex and able to clean better in hard water because they do not produce soap scum. Detergents are usually synthetic compounds that originate from crude oil. To isolate and extract DNA, scientists treat plant or animal samples with a detergent. This breaks down cell membranes, allowing scientists to study the DNA. How Does Washing Soda Soften Hard Water? Do I Really Need a Special Laundry Detergent for a Front-Loading Washing Machine?